The Accounting degree seeks to provide students with both a strong technical foundation in the field of accounting, and the biblical framework to live and work in today's world. Our goal is to equip every accounting student to make sound decisions morally, ethically, legally and in accordance with sound business practice. Students learn various accounting systems, auditing, tax law, and other critical applicable skills. Coursework, along with your hands-on experience, will help prepare students for the Certified Public Accountant (CPA) exam. An ethics emphasis and internship requirement round out this program to equip accounting majors to make difference in our world, whether employed in nonprofit or for-profit organizations. 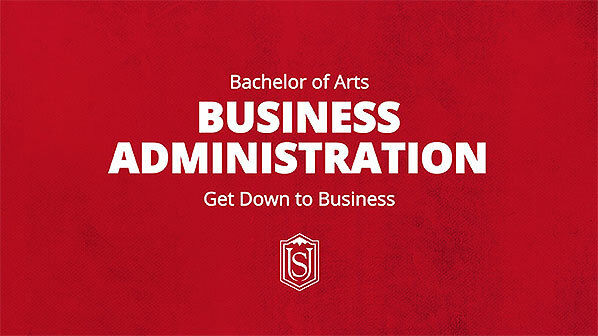 The Business Administration major is designed to provide students with a biblical business framework. This major is designed to prepare students for graduate studies, business ministry opportunities, and careers in business by shaping student knowledge, skills, and development. By emphasizing core business principles along with moral, ethical, and biblical values, our goal is for students to graduate as critical thinkers who are able to identify problems, collect data, weigh alternatives, and implement solutions from within the context of a Christian worldview. Students will demonstrate ethical decision making and apply biblical based concepts or servant leadership to management practices. Students will be able to perform entry-level accounting operations. Students will be able to use a range of techniques (manual and automated) to perform analysis, synthesize data, and make appropriate decisions. Students will be able to analyze and apply the concepts and theories of business o current management problems, domestically and/or gloabally. "I enjoyed Simpson because of the well-rounded education and atmosphere for spiritual and academic growth. One-on-one time with my professors was invaluable because I learned about real experiences on a personal and applicable level." — Alex K.
"I chose Simpson because I wanted to not only play basketball, but also to better my relationship with God." — Mark K.
"As a Christian, integrating my faith with my education is important, and Simpson has allowed me to do just that. As a Business Major, I feel comfortable taking what I've learned in the classroom, and translating it into the business world. Simpson University is a place where individuals gather together to serve God. The phrase "Community - Our Responsibility" is clearly demonstrated. "— Jessica L.
"The class sizes allow for more connection to the faculty. Professors make themselves available to students on a personal level because they prefer to work at Simpson, and in the small Christian college environment." — Scott G.
"Simpson offers an incredibly quality Accounting program full of professors with solid knowledge and experience in the accounting and general business realm. I have enjoyed taking advantage of the smaller classrooms by getting answers to businesses and career questions. I came to Simpson originally because my parents agreed to pay for the first year if I went to a Christian college - this is why I stayed." — Arin G.
"Over the summer I had an internship at Enterprise Rent a Car. For the month of August, I was ranked #2 in sales for our branch and the Visalia section. This is proof that I learned a lot in my businesses classes, from aspects of marketing, to management, and business strategy. My professors have prepared me for what the real world holds." — Humberto S.